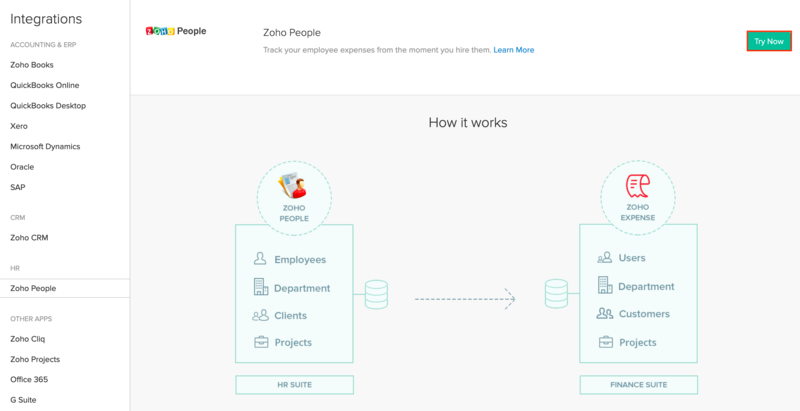 Keep all your employee data in sync between Zoho Expense and Zoho People. Every time you add, delete, or update user information in Zoho People, it gets automatically updated in Zoho Expense. Note: Before you set up the sync, ensure that you are an admin user in Zoho People as well. Log into your Zoho Expense account. If you don’t have one, try it free for 14 days! Navigate to the Integrations module, under Admin, from the left side bar. Go to Zoho People from the HR section. Click Try now. You will be redirected to the Module sync section. Click Sync People Departments to import all the Departments from Zoho People. Departments will be automatically assigned to the users imported from Zoho People. Note: Please make sure to import Departments before importing users. This will ensure that the imported users will be assigned departments. Click Configure Now next to users. 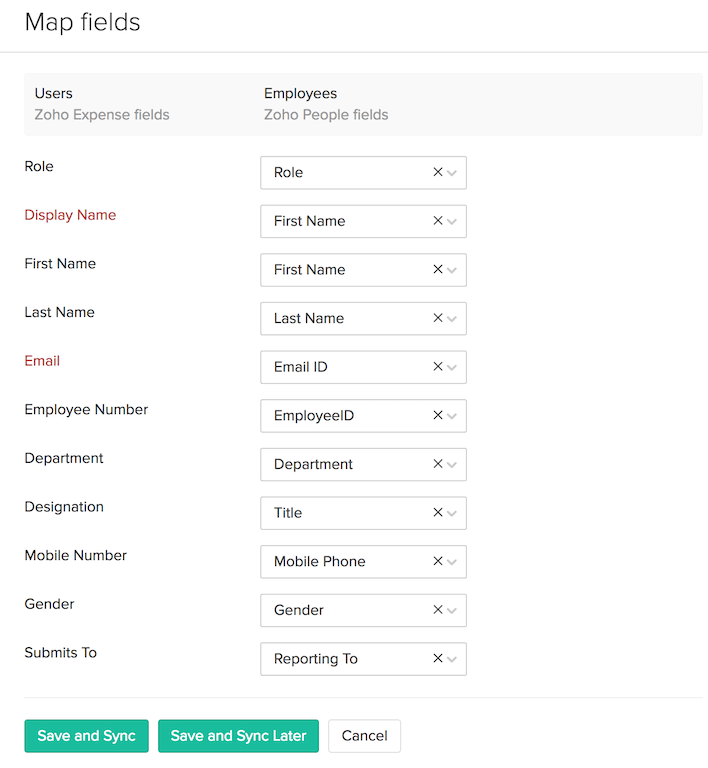 In the page that follows, map Zoho People fields with corresponding Zoho Expense fields. Employees who have users reporting to them will be added as Approvers. Other employees will be added as Submitters. You can change these user roles later. Click Edit to make changes in this setup later. Click Sync People Clients to import all your Clients from Zoho People. Clients will be added as Customers in Zoho Expense. Click Instant Sync, if you want the changes to reflect immediately. Newly added Employees, Departments and Clients (since the previous sync) will be automatically imported to Zoho Expense via the daily sync. This sync occurs once a day. You can also manually sync the data from your Zoho People account by using the Instant Sync option. But, using this option will import all of your data (departments, clients and employees) from Zoho People along with the data since your previous sync. You can check the status of your sync by clicking Show Sync History. Similarly, you can Disable Sync for a particular module, as shown below.